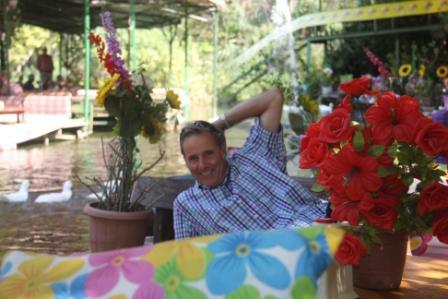 We arrived at Marti Marina near Orihanye with the main purpose of using their agent to check into Turkey. Apparently checking into Turkey without an agent is not longer possible. So although more expensive, the chekin process was very painless, all being done by remote control while we sat by the pool. It was a bit disconcerting to hand over our passports and boat papers, but all were returned safely within the day, with visas for us and a transit log for Sea Cloud. 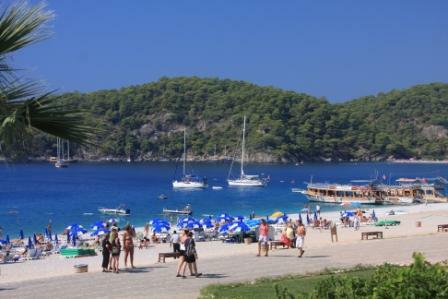 We spent a very pleasant week pottering around the lovely bays around the Hisaronu Korfezi and Bozburun. 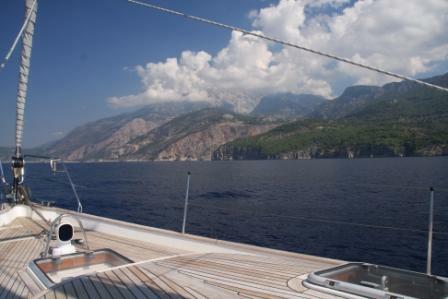 We were pleasantly surprised by the great variety of uncrowded anchorages where in most places, we could free anchor. 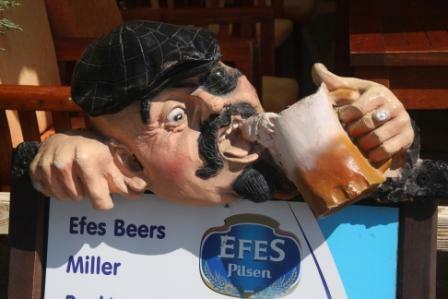 We had a lovely taste of the Turkish hospitality and entrepreneurship, lots of friendly faces running little restaurants with the most dodgy looking, but seemingly sturdy piers where you can dock. 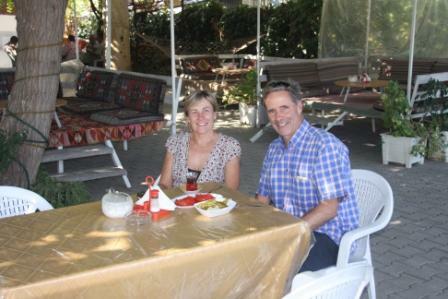 The crowds all seemed to be at Marmaris Yacht Marina where we had booked Sea Cloud for August. For a short anxious while we thought that we might not have a berth, but were ‘shoehorned’ into the tightest corner imaginable. Not great, but better than nothing. Most worrying was that we knew that Sea Cloud would have to be moved numerous times in our absence to enable other boats to get out. After a mad month working back in Sydney, we returned to find Sea Cloud still intact, with loose lines and a bent stanchion. Could have been worse. With little wind predicted, we took advantage of the marina berth in Marmaris, we headed to Rhodes which was only an hour away by ferry. We spent a wonderful few days, soaking up the history of this fabulous old town with buildings showing the influence of prior occupation by the Romans, the Knights of St John, the Turks, Italians, Germans and British before finally becoming Greek post WW2. 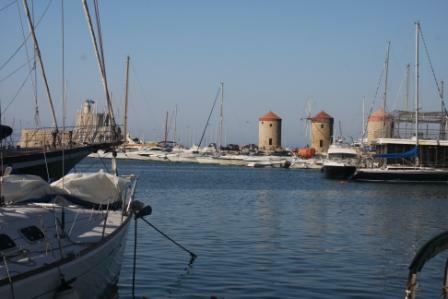 We had been advised not to sail as the harbour is so crowded in Rhodes, but found out that you can book a spot, so plan to return to this lovely island. 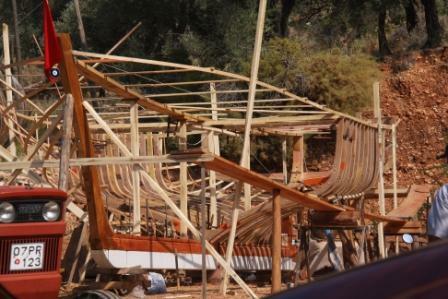 The rest of this month was to be one of sailing and visiting the some of the many ancient sites between Fethiye and Antalya. Great to be back sailing again, our first night out of Marmaris was at Ekincik where we were surprised to see 8 Aussie flags (a Mariner sailing charter fleet) at the restaurant dock. 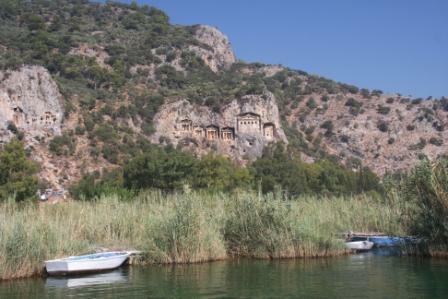 We joined the Mariner group on a boat tour to visit the ancient site of Kaunos, with its fabulous rock tombs set high above the Dalyan River. 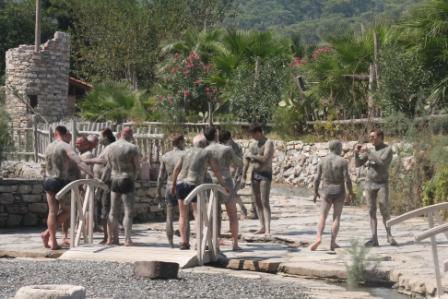 We joined the Mariner ‘Race’ to their next destination Sarsala in the Fethiye Gulf. 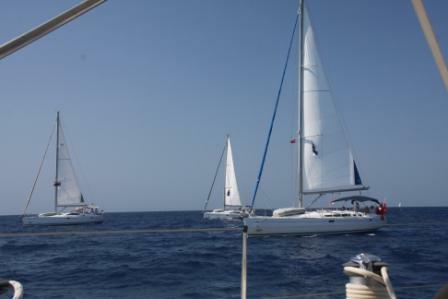 We were very pleased with Sea Cloud’s performance, she held up admirably against the many lighter production boats sailed, some sailed by very serious racers. 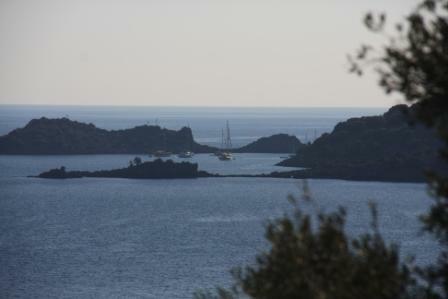 Aftera long day of motorsailing, we arrived in Kas Harbour where Sea Cloud was squeezed in amongst the fishing boats. 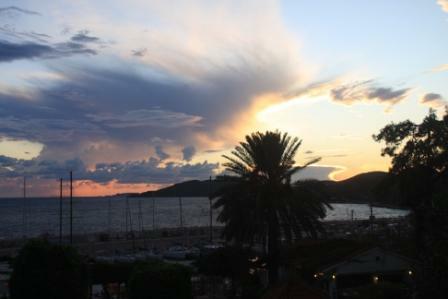 We really enjoyed the town of Kas, which was to be our base for a week as we took advantage of a very good deal at the lovely, brand new Kas Marina. 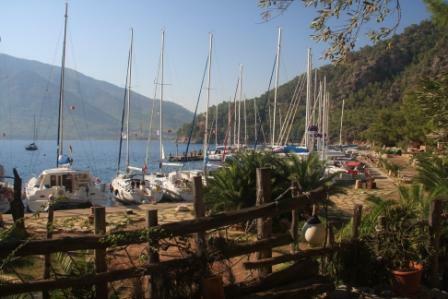 The marina is in a great spot, a quiet bay a short walk from town, past the site of the Friday market and the local Gulet builder. 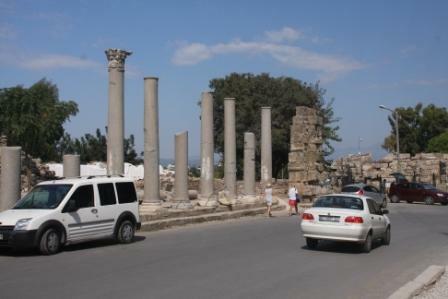 Xanthos, Letoon and Patara 3 Lycian cities within easy drive of either Kas, Fethiye or Kalkan are well worth visiting. Xanthos is a huge, previously important site with ruins of Lycian city and tombs (400 BC) a Roman amphitheatre, and village and a Byzantine church. 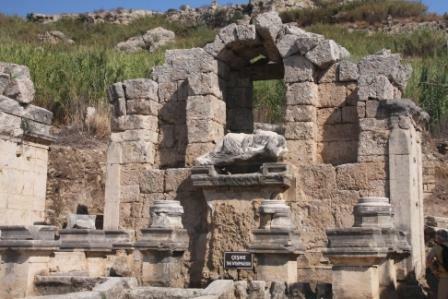 It is said that the Lycians in Xanthos were fiercely independent people who twice in their history resorted to mass suicide by jumping off the cliffs to the river below, rather than succumb to occupation by invading forces. 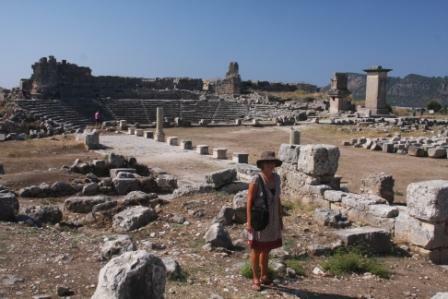 Letoon, is much smaller but beautiful site with a partially excavated amphitheatre and ruins of temples amongst the cornfields on the lowlands near Xanthos. 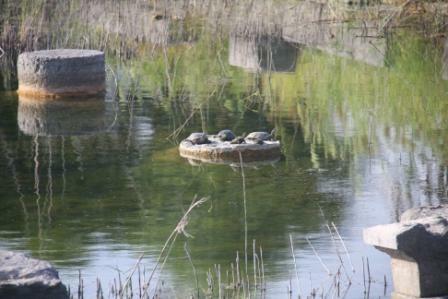 In particular we loved the turtles basking on the rocks in the middle of the submerged ruins. 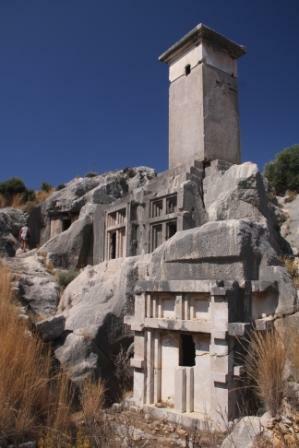 Patara, one of the oldest and most important Lycian cities lies partially covered in sand behind the long and lovely Patara Beach. 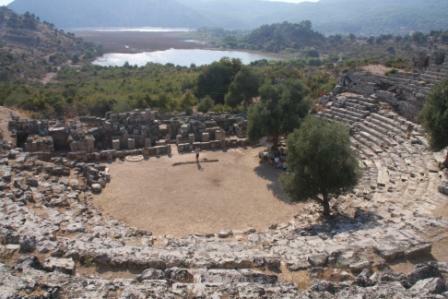 Parts of the site are being reconstructed, while local farmers still occupy land around the ruins with their goats grazing along the edge of the amphitheatre. With Sea Cloud safely moored at Kas Marina, we drove to Anatalya. 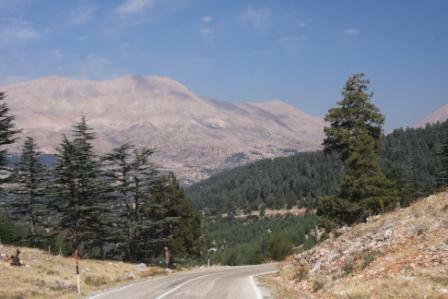 The inland road between Kas via Elimali and Termessos to Antalya is a spectacular, steep and winding mountain road. 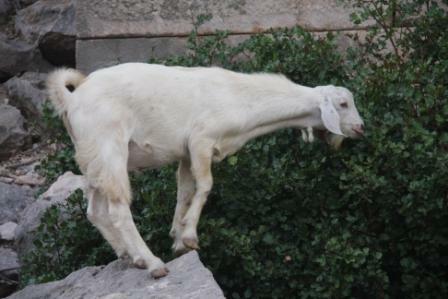 Obviously a great area for goats! 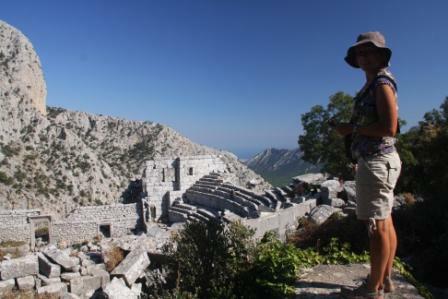 About 30 minutes out of Antalya is the ancient site of Termessos, set in a wonderful strategic location on a plateau high in the hills looking down to what is now Antalya. The ruins are quite overgrown, but wandering around the amphitheatre, the huge underground cistern, remains of temples, roman baths and rock tombs one can imagine life here in the hilltops. 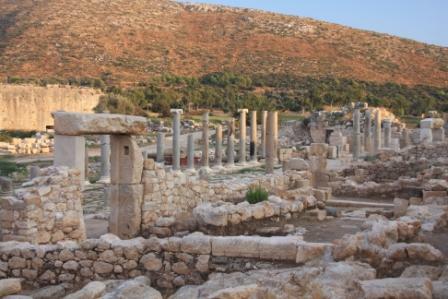 The remoteness of the site and the ferocity of its inhabitants meant that it was one of the few sites not overtaken by Alexander the Great in 334BC. 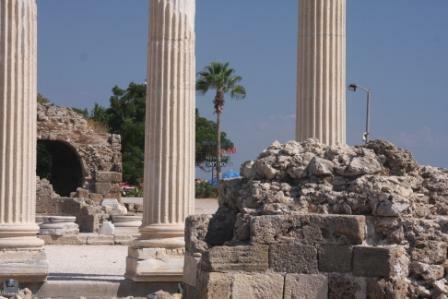 The old town of Antalya, Kaleici , is a wonderful place to stay, a great base for visiting the ancient sites of Perge, Aspendos and Side. 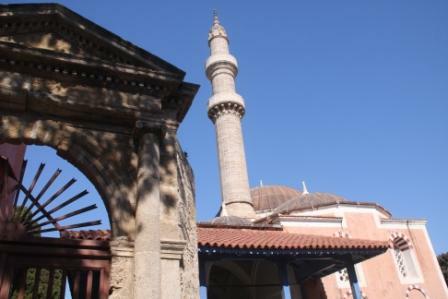 In Kaleici, many of the old Ottoman style buildings with their lovely internal courtyards converted into small boutique hotels and restaurants. 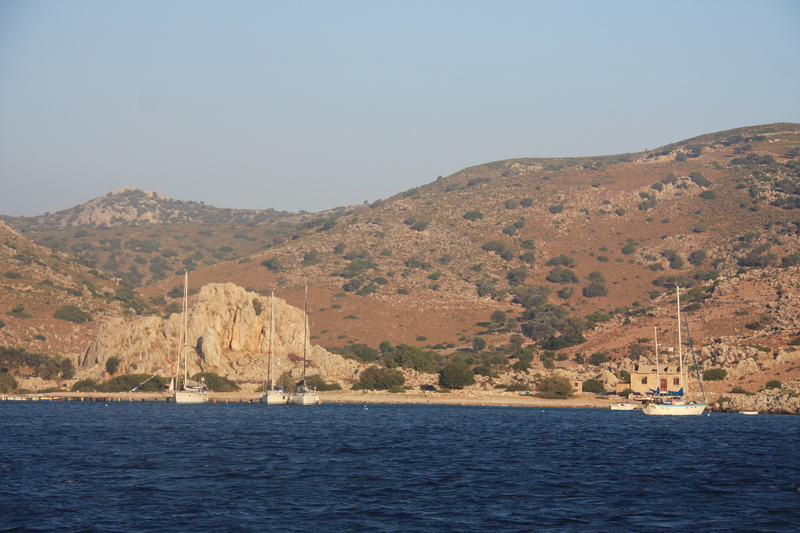 The small harbour, looked very crowded with local boats, not sure how easy it would be to get a spot here for Sea Cloud. 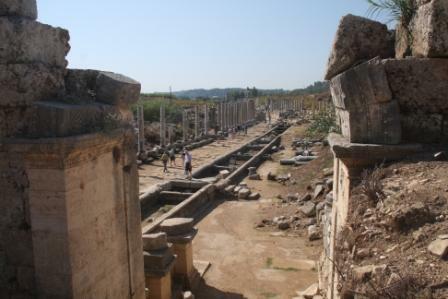 Perge, which is about 15minutes from Antalya, was memorable for its fountain and water channel that ran down the middle of the main street, its huge Roman baths and stadium. 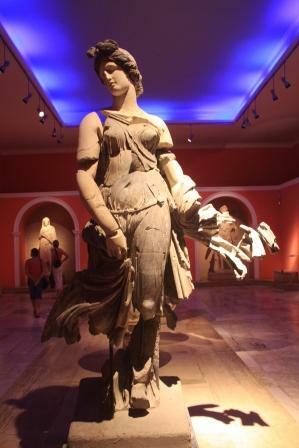 Perge is one of the few sites in this part of Turkey which the Turks have excavated themselves, resulting in many wonderful statues and sarcophagi being collected and on view in the Antalya Archeological Museum. 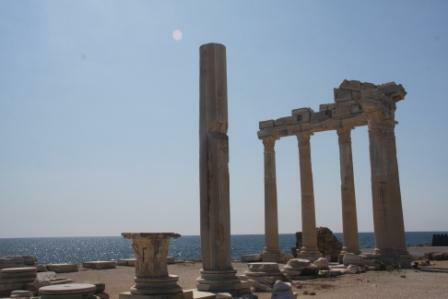 Side is described by the Lonely Planet Guide as the “Turkish version of a carnival by the sea” and that “Entering the town is like entering a film set; glorious Roman and Hellenistic ruins mark out the road”. So true! We were informed by a Turkish rug salesman (so must be true) that UNESCO’s plan is to turn the site into an archaeological park. So, within 10 years the tacky town in the midst of the amazing ruins will be demolished. The best and worst of Side today. 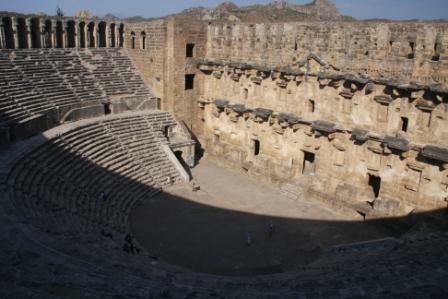 Between Side and Antalya is Aspendos, the site of one of the best preserved Roman theatres which is used for performances throughout the season. 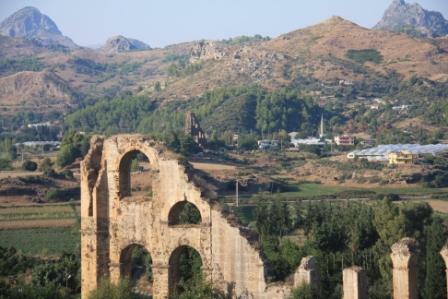 Other ruins include a wonderful aqueduct. 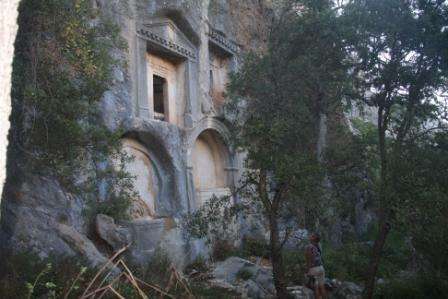 The coast road between Antalya and Kas is dotted with other spectacular ancient sites. 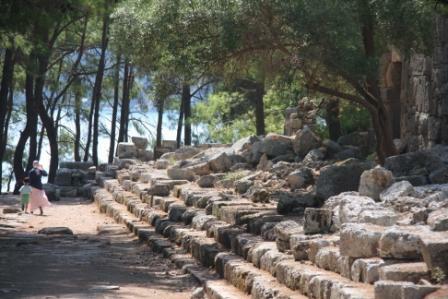 The ruins of Phaselis , are located between 3 natural harbours. It is a beautiful site with people picnicking among the ruins and swimming next to sunken sarcophagi. 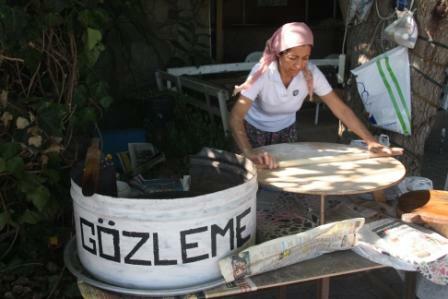 Lunch was a freshly made Gozleme (Turkish pancake) at one of the many small roadside stalls. 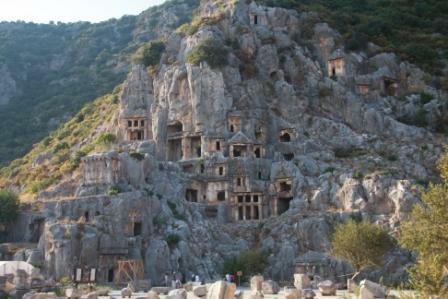 Myra is famous for its Lycian rock tombs and Roman theatre. Unfortunately we were too late to see the Church of St Nicholas (Santa Claus), but not too late for a fresh pomegranate juice. 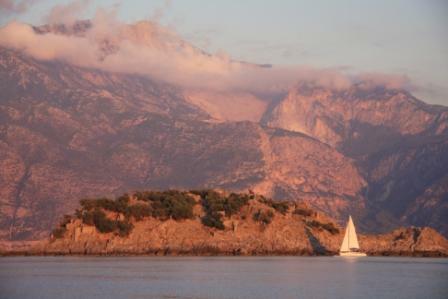 As we were up to day 89 on our Schengen visa (90days in any 6 month period), we caught the ferry across from Kas to Kastellorizon, a 30minute trip across from Turkey. 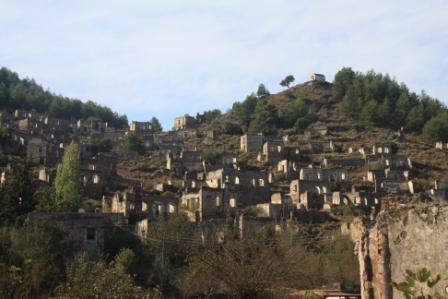 The town was destroyed following WW2 resulting in the departure of most of its inhabitants. 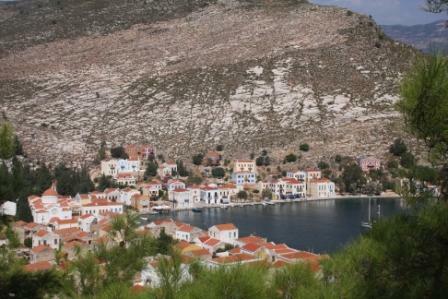 The small township which has been beautifully restored now inhabited by only 400 people, many of Australian/Greek origin. 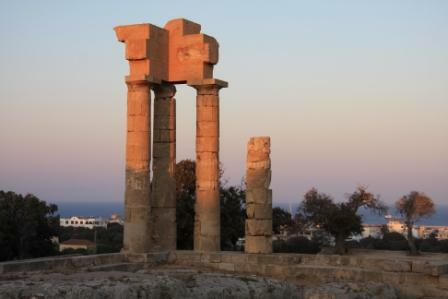 It is hard to believe that this island had a population of 10,000 about 100 years ago. 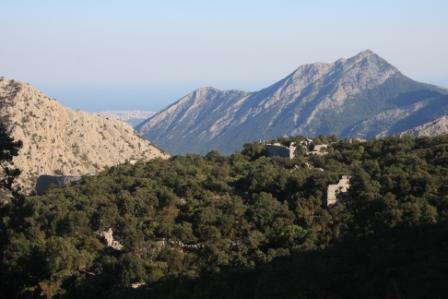 The walk to the monastery at the top was well worthwhile as the views over the harbour and town were fabulous. 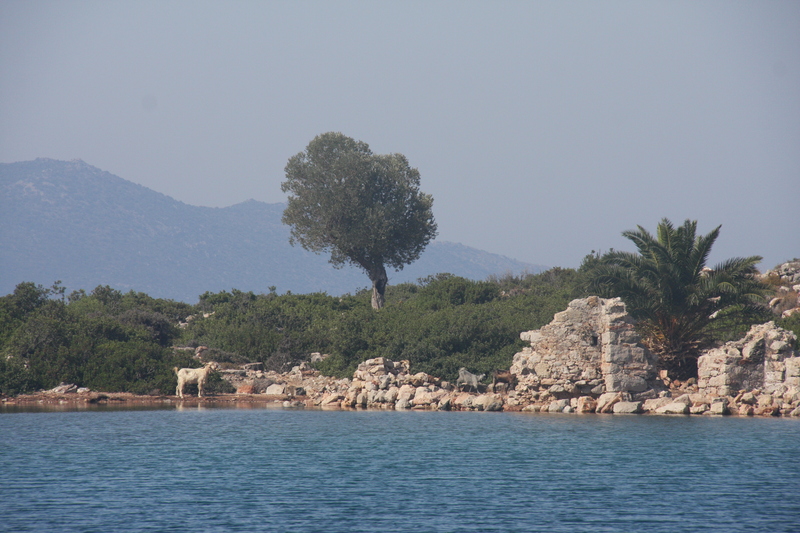 Finally back on board and a short sail to Kekova, where we anchored in the lovely quiet Polemos Boku, a short walk to ancient Aperlae. Luckily we were tipped off (by the local rather quirky cafe owner) that the best way to see this site is by snorkel and mask. 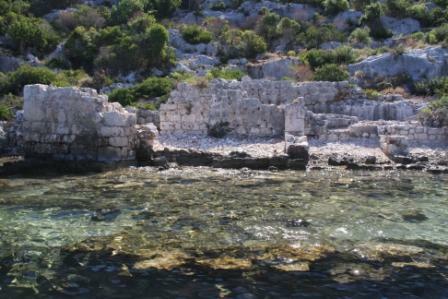 Amazing to snorkel over what was once a colonnaded street and houses. The rocky shore was littered with broken pieces of clay pottery. It felt incredible to pick up and hold these ancient pieces then put them back on the beach for others to do the same. 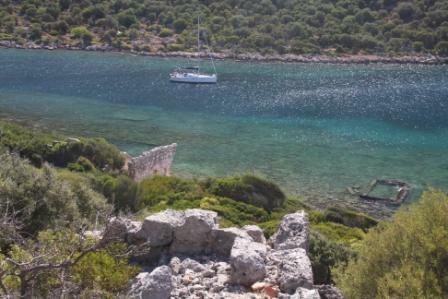 The area of Kekova is spectacular for sailing. 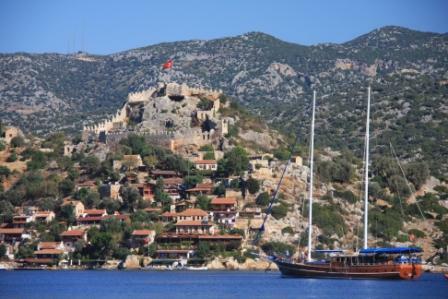 The fortress at Kalekoy and the ruins on and submerged around Kekova island and tombs around Ucagiz were wonderful to explore via ducky once Sea Cloud was anchored in the sheltered bay in front of Ucagiz. 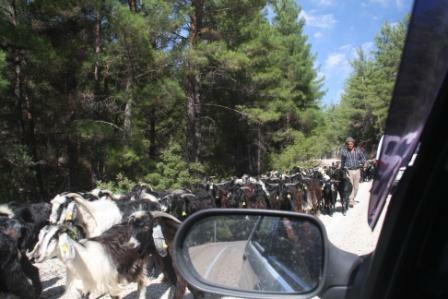 We now know why the waterway is termed ‘Kekova Roads’ after seeing about 20 gulets pass in about 15minutes. We took advantage of the right conditions and headed back past the Seven Capes (reputation as Turkey’s Cape Horn) in the calm, and moored at Karacoren Restaurant. 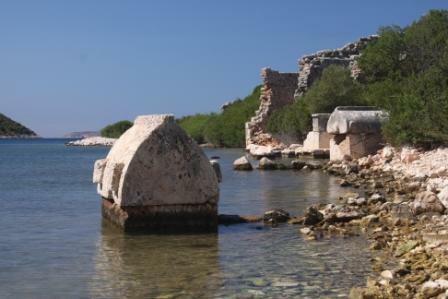 This was a good safe site from which to visit the ruins on Gemiler Island and the town of Kaya. 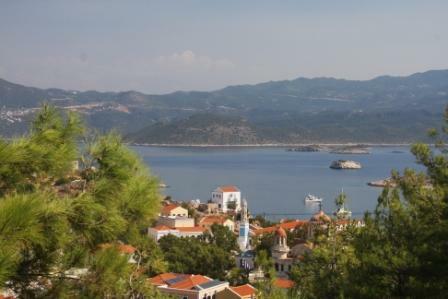 The novel Birds without Wings (a great read) is based on the story of this town which has been deserted since 1924 following the expulsion of its Greek inhabitants back to mainland Greece. 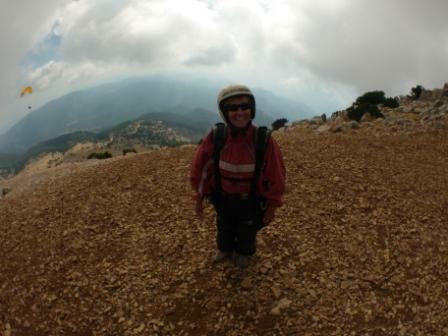 From Karacoren, we could also view the mountains above Olu Deniz, site of our planned paraglide. 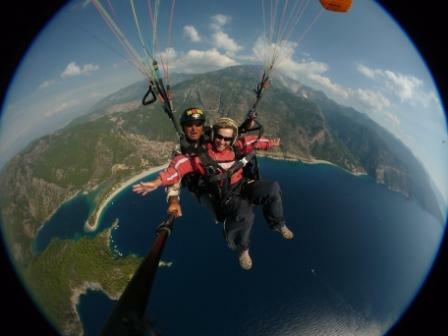 Olu Deniz is a beautiful beach (even by Aussie standards) and the 1820m high mountain above it is one of Europe’s most popular paragliding sites. 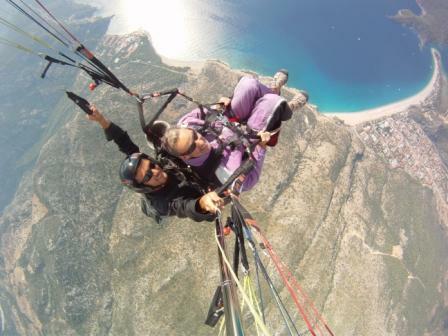 It was an incredible experience, jumping off a cliff into the clouds then 30minutes of floating above stunning scenery, then landing on the beachfront in tandem with our rather “out there” Turkish ‘pilots’ Ali and Moustafa. By mid October, summer is almost over. Although the water is still warm, temperatures are in the low 20’s and the unsettled weather has arrived. 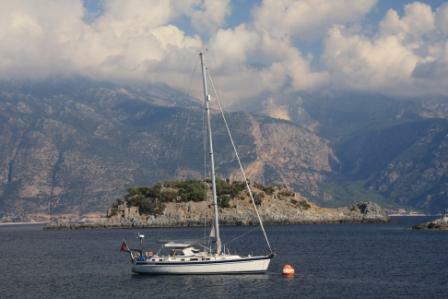 We spent the last few days of the season sitting on a Turkish mooring buoy in a sheltered bay just out of Gocek. We spent the first day swimming and relaxing and then listened to pouring rain and 30knot winds shrieking in the rigging, whilst we prepare physically and mentally to take Sea Cloud out of the water and return to our ‘normal’ lives in Sydney. 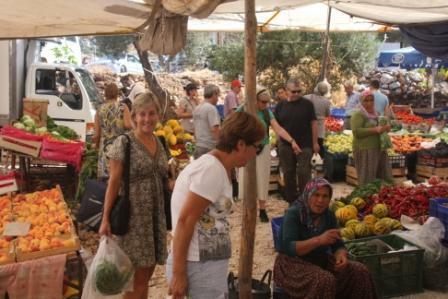 Our first few months in Turkey has been great, with friendly hard working people, good food, a low cost of living, wonderful sailing grounds and incredible ancient sites. 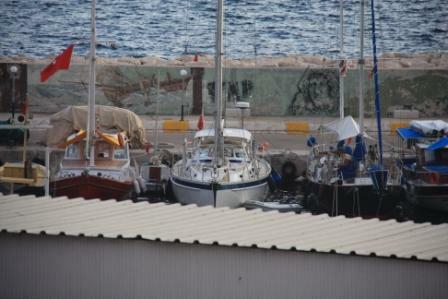 Sea Cloud is safe on the hardstand in Marinturk Marina until we return in April 2012 for more wonderful cruising.